For further information about donating books please call the Donations Manager, Nancy Holland 530.219.5656. When your books, DVDs, and CDs are donated to the library they are put to good use. Your donation might become part of the library collection if there is a need for it. 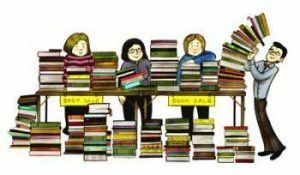 Many donations are sold at the Friends book sales. 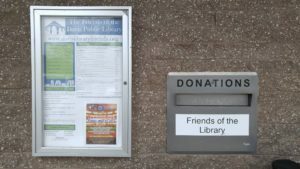 Book donations are made to various groups including other Friends groups, community clinics, local schools, other county libraries, social agencies, Better World Books, and the county jail and juvenile hall. We especially like: women’s, news, finance, how-to, travel, cooking, art and architecture magazines. We do not accept: encyclopedias or other sets such as Time/Life books, technical journals, Readers Digest condensed books, Via (the AAA publication), AARP periodicals, or VHS tapes. Use the special Friends book slot easily accessible from the Library parking lot. It is marked as the drop-off point for both books and magazines and connects directly to the Friends sorting room. If, for some reason, your donations will not fit through the slot, leave them in boxes or bags outside. Due to occasional theft of materials left outside, use the slot if possible.